Every night I sleep out in the open in my tiny bivvy bag. This is basically a small waterproof bag that goes over my sleeping bag. It’s advantage over a tent is that it is very lightweight and I set it up in less than 30 seconds by simply unrolling it on the ground. Three nights ago in a campsite at Mataranka I was sleeping under a tree when around 11am I woke to feel someone lying over my feet. My first thought was that someone had crept up and gone to sleep using my feet as a pillow and in the darkness as I looked down I saw what I thought was a large rabbit lying quietly on my legs. I wasn’t quite sure what to do but but eventually moved my feet and made a grunt to chase the rabbit away. To my surprise it moved up closer to me and I saw it was actually a wallaby. 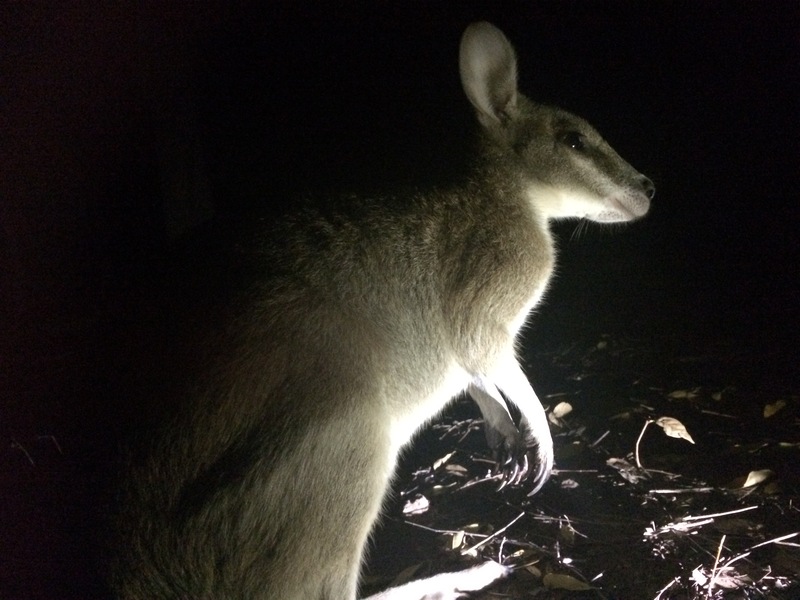 All night until 530am the wallaby sat with me and seemed to enjoy my body warmth. By 530am when I rose it was nestled in against my shoulder and I lay there looking at this curiously shaped animal for fifteen minutes as it rubbed it a stomach and chewed imaginery food. This one must have been the campground pet but to share an experience with an animal like this was pretty special. Here is a photo of the little fella. Here is a short video of the ride to Mataranka pit together by Alistair Harding. I have started experimenting with different routines – leaving on the bike at 630am and trying to knock out 100km or so before lunchtime. I then rest for a few hours during the heat and have time to do another 40km or so from 430 to 630pm when the temperature drops. I rode for thirty minutes in the dark two nights back and can honestly say that seeing a road train approaching during the darkness at 130km per hour is very intimidating. They are lit up like ships and with a roar like a 747 taking off you hear them bearing down on you for a few minutes before they smash past in a blaze of lights, noise and wind. It put me off trying too much more night riding unless absolutely necessary. Two nights ago I slept in a rest area on the side of the road. There were small scrub fires all around the rest area so the area was thick with smoke and many insects. Yesterday I made 100km to a roadhouse called Dunbarra then today I did another easy 100km to Elliot. Last night I got chewed to death by insects and have lots of bites all over. I am pacing myself as my fitness builds up a little more then I will start upping the daily mileage. My big decision is about to come. I will in two days time reach ‘three ways’ junction where I need to finalise my route to Coffs Harbour. Either I go strait down the Stuart highway to port Augusta and “Turn Left to Coffs to make a longer trip of 4500km or I turn left at three ways and follow the Barcly Highway across to Coffs for a shorter route of 3800km. Decisions decisions. Anyway – bye for now! Posted on May 21, 2017, in Rowing Home. Bookmark the permalink. 1 Comment. Better a wallaby than one of Australia’s less friendly critters.